If you can’t tell already, I have taken full advantage of the quiet summer months, reading like I was running out of air. I feel like my adult brain is finally firing back on all cylinders. Interestingly enough, I’ve been a serial, monogamous reader for as long as I can remember- one book at time. Start to finish. This summer though, I’ve been reading and thinking my way through all of these books in a very non-serial way. I’ve tended to pick up the one that most closely matches my mood and thought processes at the moment. I guess it helps that two of them are essay collections, so they lend themselves well to non-monogamous reading. I wonder if it’s a trend that’ll hold? That being said, I haven’t finished any of these in total, but what I’ve read of each has been just what I needed at the time. So, so good. Lovely. I am a reader that always has lots of books on the go; I think right now I have at least 7-9 of them going. 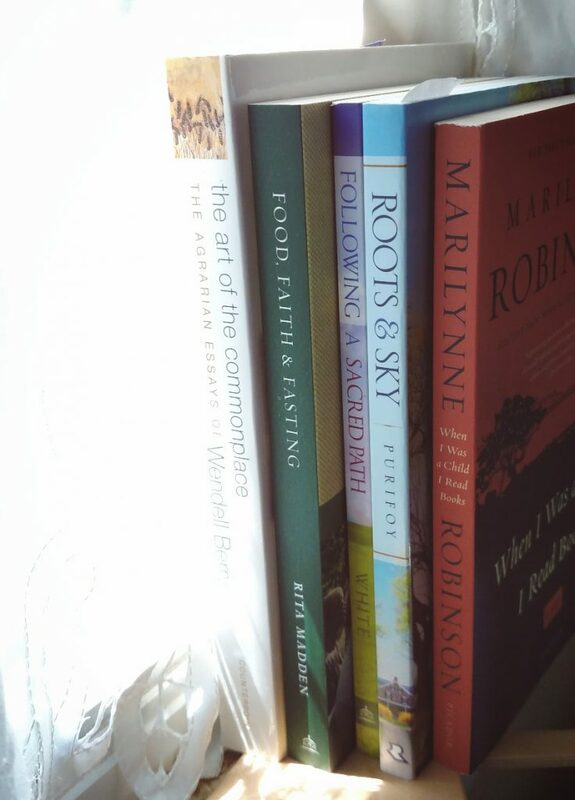 I am very much like that – what I need to read at the moment – and for various things (spiritual/learning, encouragement, to teach (Sunday School), to be fed inwardly). God bless you dear one! I read Food Faith and Fasting today. Thank you so much. Very Healing and helpful.